Tap 9 area to cycle hand colors. Tap Center for dim mode menu. Tap Color text to cycle dim mode color Blue or Green. Tap Mode text to cycle dim modes Normal, Always On, Auto Always On and Off. Tap X to close. 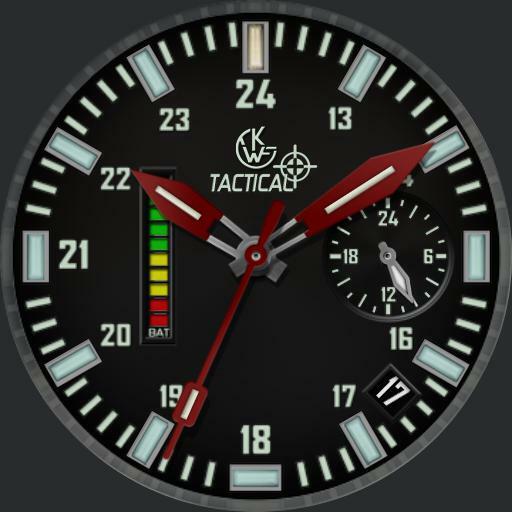 Tap 24 hour dial area to change 24 hour mode, 1 = local, 2 = UTC, 3 = TZ1, 4 = TZ2 and 5 = TZ3. Seconds hand is phone battery level indicator in dim and functions as follows.. pointing towards 1200 = 100%, 900 = 75%, 600 = 50%, 300 = 25% etc.